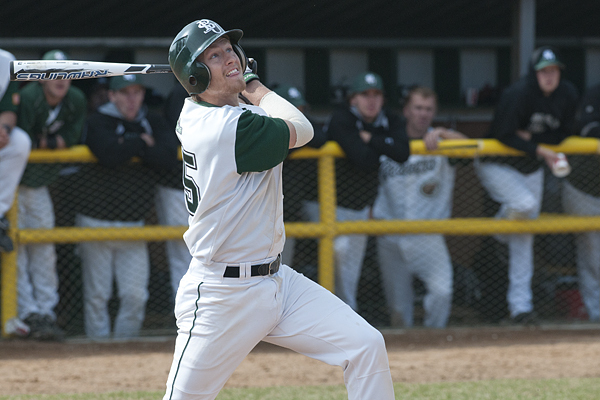 The Bemidji State University baseball team fell by identical 3-2 scores in a nonconference doubleheader against Wayne State College at the H.H.H. Metrodome Thursday night into Friday morning. BSU left 10 runners on base in game two, which went nine innings, and 13 total in the two games and now own a 1-5 record. A one out double by the Wildcats set-up a 1-0 lead in the bottom half of the second inning in game one, but BSU responded with two in the top half of the third to take a 2-1 lead. Senior Matt Ellinghuysen (3B, St. Charles, Minn.) ripped a two strike double down the left field line to start the inning. Senior shortstop Lewis Baumann (Colorado Springs, Colo.) reached first on a strikeout, as the catcher smothered a wild pitch, but didn’t throw down to first and the senior gained the bag. Junior outfielder Chad Hanson (St. Paul, Minn.) then put down a textbook bunt to advance the runners , then a wild pitch moved Baumann to third and Ellinghuysen across the plate. Freshman Joey Hanowski (INF/OF, Little Falls, Minn.) plated Baumann on a ground to first for his fifth RBI of the season. Unfortunately, that would be the only runs of the game for the Beavers, as WSC posted a run in the fourth to knot the game 2-2 and then manufactured a run in the bottom of the sixth, which was started by a lead-off walk, to own the 3-2 lead heading in the seventh. Senior outfielder Trevor Purvis (Rio Rancho, N.M.) drew a two out pinch-hit walk, but was stranded and the Beavers fell by one run for the second time in three games. Senior lefty Phil Bray (Chatfield, Minn.) threw 5.1 innings and allowed three earned runs on four hits with four strikeouts and one free pass. Both teams only produced four hits and left three on base. Ellinghuysen went 1-for-2 with a double and a run scored. The Wildcats struck first again in game two after a lead-off triple in the top of the second guided them to own a 1-0 lead. The lead went to 2-0 in the top of the third after a lead-off walk and then a hit led to a sacrifice fly to center to plate the run, but a double play ball got BSU starter Ryan Anderson (Sr., RHP, Lino Lakes, Minn.) out of jam and kept the game at just a two run differential. Baumann’s sixth career homerun in the bottom of the fifth on a 1-1 offering cut the Wildcat lead in half at 2-1. Anderson settled in after allowing five hits in the first three innings and gave-up just one hit in the next two frames. He was replaced after five innings by sophomore right-hander Jack Hegarty (Brainerd, Minn.), who set down the Wildcats in order in the sixth. In the bottom half of the six, senior Jaryd Marks (1B/RHP, Cottage Grove, Minn.) hit a high fly to shallow center and created a double out of the play with one out. Senior Logan Kalis (OF/RHP, Little Falls, Minn.) followed with a full count walk. Purvis then grounded to second, but the Wildcat second baseman threw a double play ball into left field and Mark scored from second to tie the game 2-2 and knockout WSC starting pitcher Eric Schwieger. The Wildcat reliever only needed on pitch to end the inning on a 1-6-3 double play. WSC put runners at the corners in the top of the eighth to knock out Hegarty, but Kalis came in and got the Wildcat batter to ground into the third WSC double play of the game. Kalis, who was the designated hitter before coming into pitch, doubled down the left field line in the with one out in the bottom half, but was left there and the teams went to the ninth. With two outs a Wildcat batter laid down a nice bunt to third and Ellinghuysen tried to get him at first, but threw the ball into the WSC bullpen in right and the batter advanced to third. Kalis got the next batter to swing at the third strike, but it was outside and catcher Riley Hirsch (Sr., Little Falls, Minn.) couldn’t get a glove on it and the runner came across the dish for what would be the winning run. Back-to-back infield hits from the eight and nine-hole hitters, Ellinghuysen and Baumann, started the ninth for BSU. Hirsch moved the runners up a base with a sacrifice bunt, then Hanowski was intentionally walked to load the bases. WSC reliever Trevor Reeves got Braun to ground into a double play on the second offering of the at bat to end the game. Kalis suffered the loss after hurling 1.2 innings and allowing the one unearned run on one hit with three strikeouts. Hegarty threw 2.1 frames and allowed zero runs on three hits with one K. Hirsch, Kalis and Baumann each recorded two hits, as the Beavers posted nine in the game. The Beavers continue Metrodome play Feb. 26 with a nonconference doubleheader against Minnesota State University, Mankato at 5 p.m.